• Collect entire Pr3d region (up to 990eV), making sure both Pr3d5/2 and Pr3d3/2 components are acquired. Direct overlap between Pr3d and Cu2p peaks. Praseodymium should be stored under a light mineral oil or sealed in plastic as it will develop a green coating which, in return, exposes more metal to oxidation. First discovered in 1885 by C. F. Auer von Welsbach, a German chemist, praseodymium’s primary use is as an alloying agent combined with magnesium to create high-strength metals for aircraft engines. 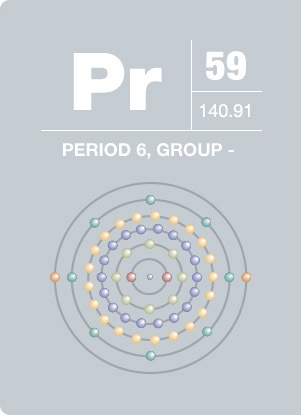 Praseodymium is also a necessary element for studio lighting and projector lights used in the motion picture industry. The element also forms the core of the carbon arc lights. Praseodymium gives glasses and enamels a yellowish color. The element has no known biological role.